Why Should You Choose Millington, TN? "Millington is poised for explosive growth as a convergence of factors lead it into a future of economic maturity." 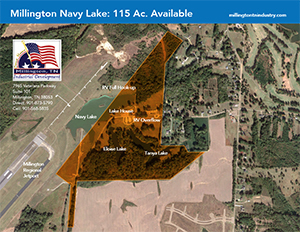 The Millington Navy Lake site is a multipurpose indoor and outdoor recreation area that encompasses 115 acres. A multi-use lake house is one of the focal points of this site as it is a rustic, air conditioned facility covering 3500 square feet. This site is conveniently placed next to the the Millington Airport and a joint U.S. Navy and Tennessee Valley Authority solar farm that will be under construction in 2018. © Copyright 2015 Millington Industrial Development Board. All Rights Reserved. All information is subject to change without notice.